I'm all about making mood boards when I'm dreaming up a new design project. My blogging/beauty room currently does not have a desk, and I really want to create a cozy place for me to sit and blog or edit my videos. I have put this picture together of pieces that I want to pick up for my new office space. Just looking at it makes me happy! P.S. The desk is actually a dressing table; if any of you have this one do you mind telling me if it would work well as a desk? Is the height okay for a normal desk chair? The dressing table is a normal desk height. I just can't sit cross-legged (which drives me nuts!) and pull out the drawer because it's low, but a normal chair should fit no problem! ooh I like sitting cross-legged too! If you don't pull out the drawer can you sit cross-legged? 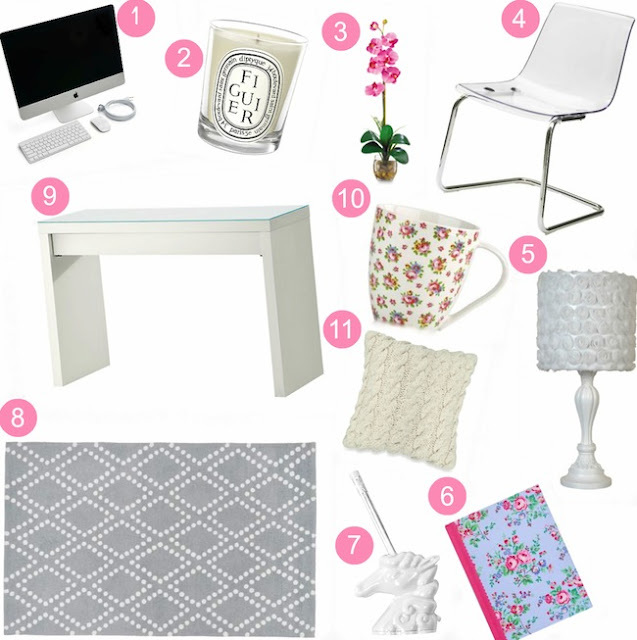 I'm in love with the Unicorn pencil sharpener, the floral journal, and the floral mug!! If you're planning to put this in your dining room, the carpet makes the desk very unsteady. I have it on carpet and it's wobbly whenever I close the drawer and stuff....quite a delicate piece of furniture, but I do love how it looks! Love all the pretty items! I have the desk its a nightmare its so small the draw never works and I cant sit cross legged on it dont get it!!!!! I have that lamp and Love it! The chair has a nice aesthetic, but will it be comfortable if you're working for extended periods of time? It has no arm rests and I suspect you'd have to put some sort of cushion down on it! These things do look kind of nice! I use that dressing table as my makeup/getting ready station. I don't think it's the best choice for a desk. It's too narrow and the height is too awkward to be used as a work space. Good Luck! With which program do you make this mood board? I use the dressing table as a place to hold me make-up and sometimes I bring my desk chair over but my chair would be to tall that I can't even put my legs under it. Also, sometimes I work there when my desk is a horrible mess and I would have to say that it is WAY to small to be a desk. My laptop can barely fit and I feel like it would fall off. It is amazing as a vanity/dressing table but if you want to use it was a desk try looking for something that is a little taller and maybe a little bigger so you can have room to work. But that is just my opinion! I hope this helped! I love you Elle! I couldn't live without a desk! Although right now it serves as a nail-polish display because I don't have a better place for all of my nail polish! ha! Best of luck to you in rearranging your office/filming room! You will be spending so much time in that chair, my suggestion is to go for one that's actually comfortable/Good for your back and circulation! I actually sat on that chair yesterday at IKEA and it was kind of hard and hurt my spine. It might be okay as a vanity chair or something but I agree with a lot of the other comments - I don't think it would be a very comfortable desk chair. Looks gorgeous! I love your style, very feminine and modern! I have the dressing table and I feel like it doesn't have enough room for my stuff, it all feels very cluttered, even when organized. Also, the drawer is made out of a cardboard like material so it will bend if there is something with a bit of weight in it. I enjoy reading/watching both of your blogs and youtube videos, keep up the good work Elle! I use a regular office desk from Ikea to store my makeup and you're considering using the dressing table for your office. Some people just don't follow the norm, haha. Girl! That iMac is not gonna fit right on that table! MakeupbyTiffanyD has had the Liatorp desk from Ikea for 3 years and she loves it. I'm planning to buy it for my new apartment when I move in September. Check it out and see if you like it! I have that Malm dressing table. It would be perfect as a typical desk. The standard desk height is 30-32 inches and the Malm dressing table is 30 3/4" so it's perfect! I figure most IKEA stores will have one out on display in the showroom, so you could always go and look at one in person and sit at it. I have that dressing table! It is the exact same height as my Pottery Barn desk, and fits my "normal" height desk chair just fine. I honestly think it would be fine for a desk, but you would probably have to have your computer monitor angled towards you with the keyboard by its side, if that makes sense! Good luck! Hey Elle :) The Malm is fine for a desk, you'll have plenty of room- the pull our drawer is great storage too! What site did you use to create the board? Great looking office decor! I was browsing the internet looking for inspiration for my own office at home and I came across this page. Im thinking of a more oldtimey kind of look, with big wooden computer cabinets and a 1950's looking leather chair. I'm not quite sure what to decorate the walls with though; any suggestions? These office stuffs would be nice and it can enhance the neatness of the office, I wanna buy some stuffs for my office-space too. Really inspiring blog. I like your theme to design office. What is “i heart you coffee”?